Radom & Wetter partner Susan J. Radom, Esq., presented a session on ethics at the NJICLE 2018 Community Association Law Summit. The day-long event on November 14, 2018 brought together New Jersey attorneys at New Jersey Law Center and via webcast. Ms. Radom’s presentation on ethics focuses on specific scenarios, statutes, and analysis. Community association attorneys and board members might gain insights from the presentation. The Attorney Client Relationship: Who is the client; what is the scope of engagement? Communication: Keeping the Client Informed. Conflicts, Improper Behavior by Client, Terminating Representation. Example scenarios include: potential conflicts of interests with volunteer homeowner association board members vs day jobs; threats of whistle-blowers regarding illegal behaviors by board members; subjective fine violations of property owners; privacy expectations; and more. A recognized leader who has long been involved with CAI-NJ, Ms. Radom has over 25 years working with community association law in New Jersey, providing direction to boards of directors and property owners in administration of common elements, continuation of peace, and uniform aesthetics within the community for preservation of value and investment. Radom & Wetter crafts bylaws, guidelines, and other governing documents, working in lockstep with association board members and acting as counsel on behalf of Property Owner Associations. 2018 Community Association Law Summit, presented this week by the New Jersey Institute for Continuing Legal Education in cooperation with the New Jersey State Bar Association Real Property, Trust & Estate Law Section and the Community Associations Institute of NJ (CAI-NJ). 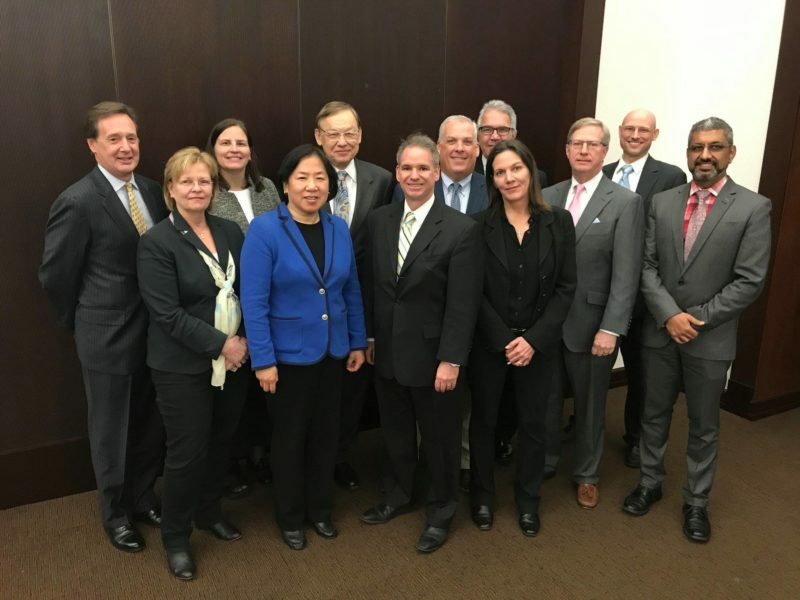 Pictured (l to r) are panelists George C. Greatrex, Esq., Shivers, Gosnay & Greatrex; Susan J. Radom, Esq., Radom & Wetter, Attorneys at Law; Caroline Record, Esq., Hill Wallack LLP; Ms. Christine Li, Greenbaum, Rowe, Smith & Davis LLP; J. David Ramsey, Becker & Poliakoff; Thomas C. Martin, Esq., Price, Meese, Shulman & D’Arminio, PC; Vincent J. Hager, IRMS, JGS Insurance; Michael Pesce, PCAM, Associa – Community Management Corp. of New Jersey; Karyn Kennedy Branco, Esq., Cutolo Barros, LLC; Robert C. Griffin, Esq., Griffin Alexander, PC; Damon M. Kress, Esq., McGovern Legal Services, LLC; Mohammed F. Salyani, CPA, Wilkin & Guttenplan, P.C. Not pictured: A. Christopher Florio, Esq., Stark & Stark. The lawyers of Radom & Wetter are top New Jersey attorneys providing counsel for community association law, business law, and personal law. The team’s combined experience and collaborative approach affords clients exceptional service throughout New Jersey. Radom & Wetter can be reached by calling (908) 707-1500 or by visiting 245 Route 22 West, Bridgewater, NJ 08807 or https://radomandwetter.com.